So I'm trying to use SkinStudio, and it just closes immediately when I try to run it. SkinStudio 8, by the way. Not sure if it has to do with the fact that I'm still running WindowsBlinds 7, but if that's the case, it's kind of annoying that there is no legacy option for SkinStudio in my downloads on this site. All I see is SkinStudio 6, which is the first version I bought, but there is no download for it. SkinStudio 8, which is what I've installed, and then WindowsBlinds 7 and WindowBlinds 7 Upgrade... whatever that is. I believe SKS8 in fact only works with WB8 Kevin. I use SKS8 and WB8 on Windows 7 and Windows 8.1 and they both work fine on either OS if you care to upgrade your version of WB. Why can't you accept that software X is designed to work with Y and not Z.
a version change, the upgrade isn't free. That's ALWAYS been SD's policy. You aren't blaming MS for changing and selling Windows though, are you? And yet, Windows doesn't make it so that nothing will work with Windows 7, and then force me to download Windows 8 apps. If there were an option to download SkinStudio 7, this wouldn't be a problem. Except, that option apparently doesn't exist. Why can't I download SkinStudio 7? It would work with the version that I already have. Instead, they've updated it, which has rendered the programs that I DID purchase useless. If MS did this... just made an app incapable of working unless you paid them more money for something you've already purchased... yeah. I'm sure I'd be complaining about it along with many others. I'm not asking for a free OD subscription here. I'm just asking for programs that I've purchased to be made available to me so that I can actually use them. If you contact support they may be able to help you. I am unsure why you are seeing SKS8 if you do not own SKS or have an active OD sub. I do own SkinStudio. Or at least, I'm supposed to. I bought WindowsBlinds and Skin Studio together back in the day, right before WB7 and SKS7 came out. Then it was upgraded for both because I had bought them within a year or something... I don't remember exactly what the policy was. 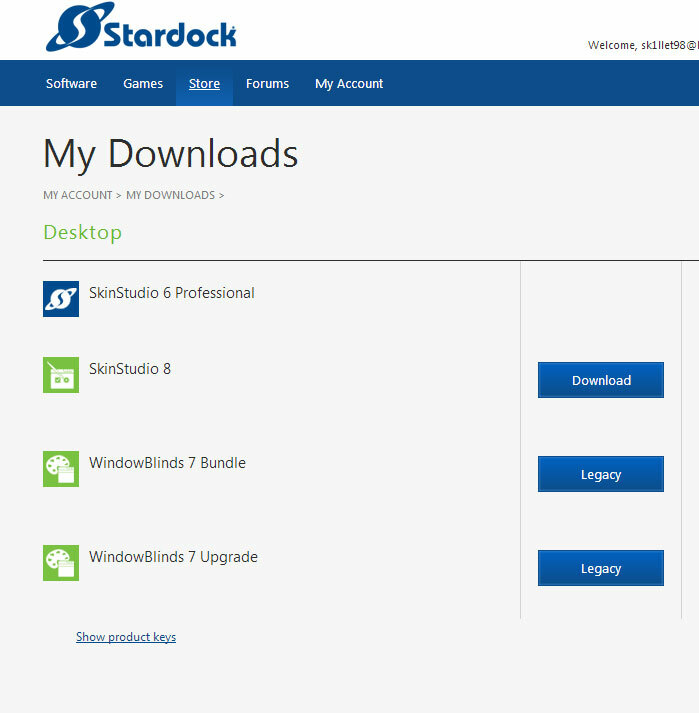 At any rate, it does say SKS8 and WB7 on my downloads page on stardock.com. Thanks though. I'll try contacting StarDock support. Interesting. I assume that has happened because SKS8 wasn't a paid upgrade to SKS7, but that is still an error as you have found and will be more of an issue going forward as the registration for SKS will be using the WB8 license in future. I will also poke some people to get it corrected. I also have sks8 available for download but not WB8, which would be required. btw, my OD sub has expired. I sent you a PM with a link to download SkinStudio 7.
thanks I got the PM and responded back. Again sorry for not being clearer with the post. Quoting gmc2, reply 8 I also have sks8 available for download but not WB8, which would be required. btw, my OD sub has expired. Argh, I had the EXACT same problem. I was using WB7 (hated the interface of 8, still do) and wanted to use SKS, but the only version available to me was SKS8. Even contacted support but they told me "We do not distribute old clients though. So unfortunately without it you would be unable to go back to v7." I ended up having to install WB8 (rawr) because I need to be able to edit skins, and that was the only way I could do it. Yup. I got the same response. You will need to use your Object Desktop serial to activate it. Since this is no longer the current supported version, it is offered as is. Thank you SO MUCH. My SKS6 key didn't work, but the one for SKS8 did. Hopefully that doesn't cause any problems when I decide to upgrade to WB8 and use that version of SKS in the future. But for now, I can make Windows 7 themes again.